ConMed OnePort Trocar — Brownlie Design, Inc.
A key component in laparoscopic surgery, the trocar is the port through which a surgeon works. 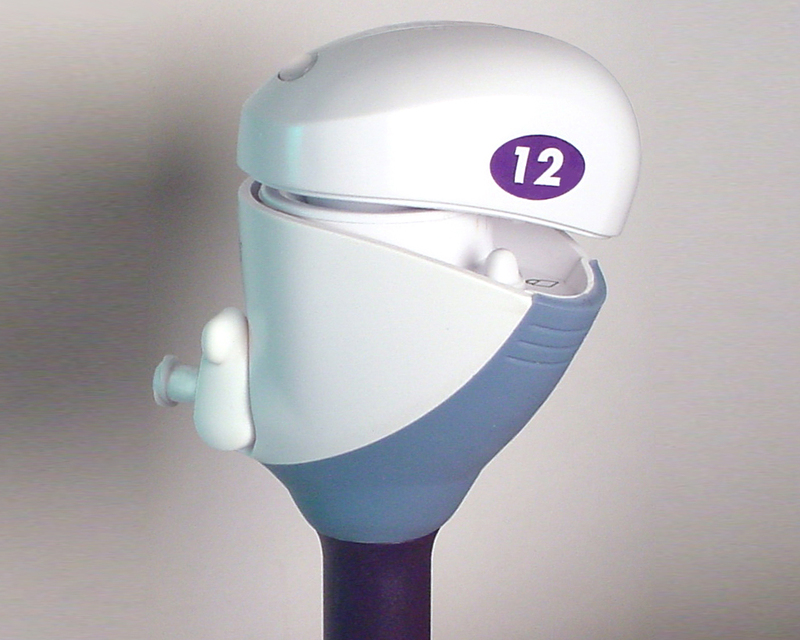 Brownlie Design studied the steps in the procedure of inserting and using the trocar. The final design incorporates a unique rounded grip that fits the surgeon’s hand providing a great deal of control and sensitivity for insertion and manipulation. Overmolded elastomer adds slip resistance to the grip plus acts as a seal between the trocar head and the cannula. Once the trocar penetrates the abdomen, the cap of the trocar is designed to be removed with a simple twist, revealing the sealed access port. The integral stopcock for abdominal inflation was an innovation that reduced part cost and reduced accidental snagging during procedure. This design program changed ConMed's approach to product development by introducing ergonomic form exploration early in the process, parallel with engineering and aesthetic development, and by relying on Brownlie Design to deliver full CAD documentation to preserve the design intent.